Brownie and cookie. Do I have your attention? I’m trying to get back on track to eating healthy. The holidays were not kind to my waistline. I’ve tried many diets that prohibit me from eating the things that I love and at the end of the day they didn’t go well. I’d either quit or put the weight back on as soon as I was quit. So I believe in moderation. I like to have my salad and to eat a cookie too, especially when we’re talking about a chocolate cookie. For those of you who follow me regularly you know that I’m somewhat of a chocoholic. Guys, no joke, there is A LOT of chocolate going on here. A LOT. 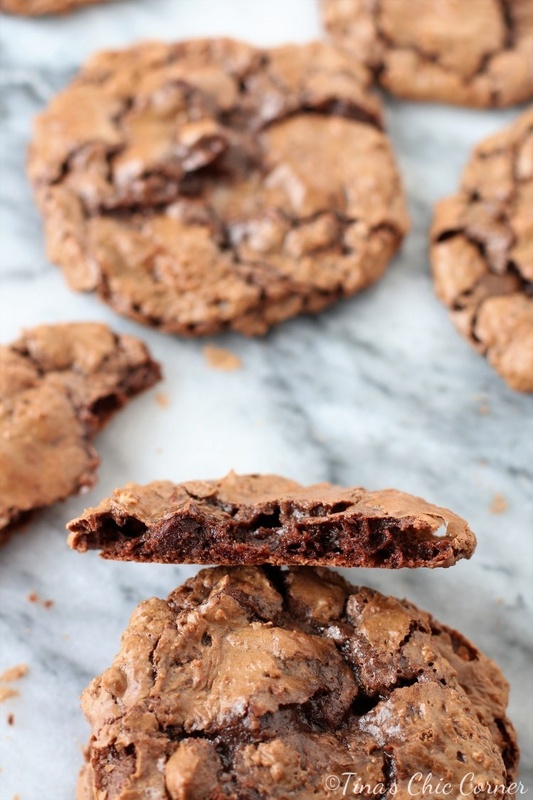 You have melted chocolate in the cookie batter and chocolate chips scattered throughout the cookie. 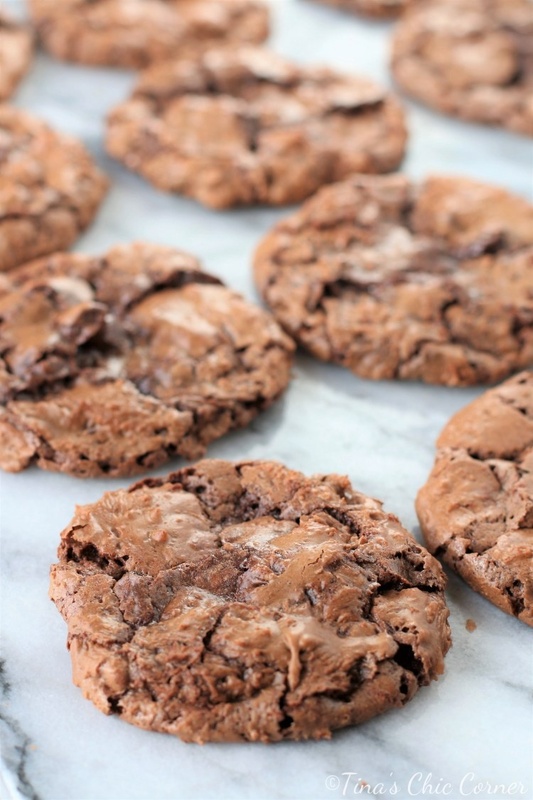 Let’s talk about melting chocolate for a second. I hate doing it, mostly because I don’t have good luck doing it. I have microwaved it and I’ve used the double boiler method, but neither method seems to be fool proof. My chocolate seems to seize up and that doesn’t seem right. Thankfully the melted chocolate, despite the weird texture, didn’t ruin this recipe (although I’m still convinced that it didn’t look right). How do you melt chocolate? I’d love to know the secret to success. My theory is that the “semisweet chocolate” in the list of ingredients is really supposed to be something like Baker’s Semisweet Chocolate instead of Nestle Semisweet Chocolate Morsels. As I mentioned, they still turned out delicious so use your own judgement. Preheat the oven to 350 degrees F. Line a cookie sheet with parchment paper or a silicone mat and set it aside. Melt the 1 pound of semisweet chocolate and butter until it’s smooth. You can do this in the microwave or in a large bowl set over a saucepan of simmering water, whichever method you have the best luck with. Using a spatula, fold in the melted chocolate. Scoop about 1 and 1/2 tablespoons of dough onto the prepared cookie sheet for each cookie. 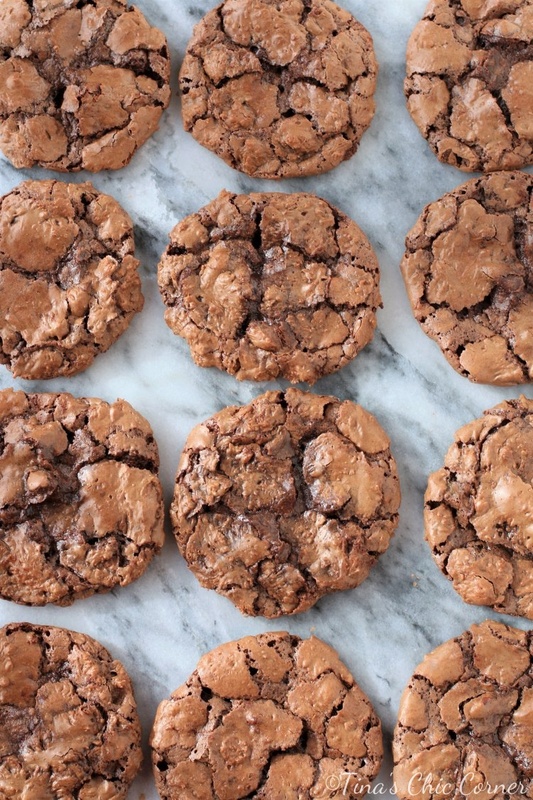 I think using the OXO good grips medium cookie scoop is key for this recipe. The cookie dough is sticky and the scoop makes it very easy to do and gives you consistent cookies. Scoop 6 cookies on each cookie sheet. They will spread, which is supposed to happen for this recipe. Bake the cookies for about 10 minutes or until the cookies look dry around the edges. They will look underbaked but that’s okay because they will set as they cool. Let the cookies cool on the cookie sheet for about 10 minutes. Genius Tina! Especially when you can’t decide whether to eat a cookie or a brownie and you’re allowing yourself one treat. This looks amazing! I find when melting chocolate, over heating it can make it seize. Low heat is the key, whether in the microwave or using a double boiler method. White chocolate especially.